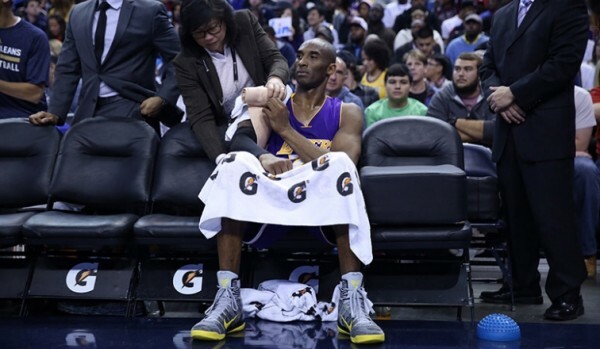 Los Angeles Lakers – Kobe Bryant Injured; Good for Jeremy Lin? The Los Angeles Lakers enter a new stage of the season – one without Kobe Bryant, as his injury might mean being shut down until the end of it, while players like Jeremy Lin could finally get the opportunity they deserve, although Byron Scott might have other ideas and plans on his mind. Jeremy Lin isn’t likely to get a starting spot. Wayne Ellington will play next to Ronnie Price, but the minute distribution will change. Lin should get 25 minutes or more, because not playing next to Bryant was one of the guidelines for Byron Scott since making his big lineup upheaval. Nick Young, the team’s most talented scorer although quite the chucker and ball hog himself, should also get more minutes, but it always feels as if Scott prefers to leave both him and Lin on the bench if possible. How long is Bryant going to be out? Six to eight weeks is the official number right now, but with the Lakers going nowhere this season, the doomsday predictions of Scott shutting down Bryant at some point are becoming true. After talking himself up so much during the offseason before showing us how bad he can be on half the nights and then getting the rest treatment to stop hurting and sucking so badly, the Kobe Bryant “revenge” season might be over after only 35 games. This is good for the Lakers, even if it costs them games. It’ll force players to step up. It’ll force Scott to do something different. It’ll give the Lakers another step into the future without Bryant. They could have gone in that direction last season, but they bulked, fearing some fan backlash, and gave him a contract worth $48 million for two years, knowing quite well how bad things might be with him as their leading player. Lin has an opening to do some very nice things. It’s up to him but only to a certain degree. Byron Scott is still calling the shots. Now that the Lakers seem closer than ever to tank mode (maybe it’s already begun, I’m still not sure because of the inconsistency in his coaching decisions), giving Lin, clearly the best guard on this team, more minutes, doesn’t sit right with the attempt to lose as many games as possible. As we’ve mentioned before and something that is quite clear for anyone watching Lakers game to see: The Lakers are at their best and most efficient when Bryant isn’t playing. Jeremy Lin? His lineups without Bryant and next to Ellington, with Young and Carlos Boozer next to another big man (Tarik Black is a good option) often prove to be the team’s best and most productive and most importantly win their minutes on the floor. The problem is winning might not be the thing the Lakers are after. It’s funny how things work out sometimes, although I’m pretty sure Bryant himself isn’t laughing. The Lakers were trying so hard to manage his minutes and his playing time over the last three weeks and it turns out an injury that’s been bothering him since preseason was aggravated. Would have more rest made a difference? Probably not. These things happen. But it just goes to show the “brilliance” of the Lakers in putting so much money and faith on the falling apart body of a player who looks washed up half the time.